Bishop was the name of the Hyperdyne Systems model 341-B Synthetic technician serving with the Colonial Marines. Bishop was supposedly designed and created by Weyland-Yutani employee Michael Weyland using his own likeness. The Bishop android was the Executive Officer aboard the Sulaco and was sent to LV-426 in 2179, to investigate the Hadley’s Hope colony. 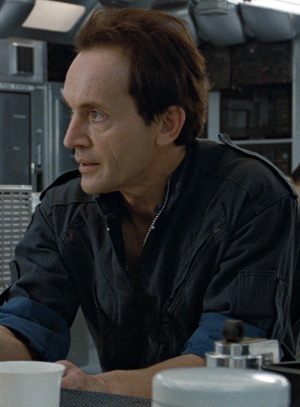 Bishop was played by Lance Henriksen and was featured in 1986’s Aliens. He also appeared in 1993’s Alien 3 as a damaged android and as Michael Bishop, the person who created the android. Henriksen also appeared as Charles “Bishop” Weyland in 2004’s Alien vs Predator film, as the founder of Weyland Industries. 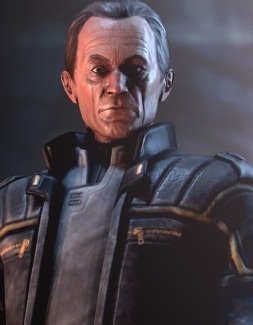 In expanded universe media, Henriksen lends his likeness and voice to Karl Bishop Weyland in 2010’s Aliens vs Predator game as well as another Bishop android in 2013’s Aliens Colonial Marines game. In 2179, Bishop was sent to the Sulaco as the ship’s Executive Officer and the combat unit’s technician. After the crew wake up from hypersleep, they all sit down to have dinner when Private Hudson asks Bishop to perform the knife trick – a game of five finger fillet incredibly fast. He places his own hand over Hudson’s and does the trick flawlessly though he does slightly cut himself during the trick and white liquid pours from his thumb, thus revealing himself to Ripley that he is an android. Ripley immediately shows some hostility towards Bishop because of her previous experiences with Ash on the Nostromo. Burke tells Bishop that Ash ‘malfunctioned’ and a few deaths were involved. Bishop explains that because of his neural inhibitor, it’s impossible for him to harm another human being. Ripley is sceptical and tells him to stay away from her. When the team dropped onto LV-426, Bishop drove the APC to the Hadley’s Hope compound and waited inside until the other marines had secured it. Once inside, he started looking over the logs trying to find out what happened to the colonists and he took interest in the two Facehuggers that had been captured in the stasis tubes. He began dissecting the dead Facehuggers trying to find out more about the creatures. At some point, Burke tells him to keep the two live Facehuggers and they were to be sent back to the company. As the rest of the group, go to the Atmosphere Processor unit, Bishop stays behind at the med-lab to further study what has happened. After the group loses their APC and dropship, Bishop looks at the Facehuggers again and thinks that there is still a creature out there that they have not seen yet – something that’s laying the Alien Eggs they saw in the Atmosphere Processor. 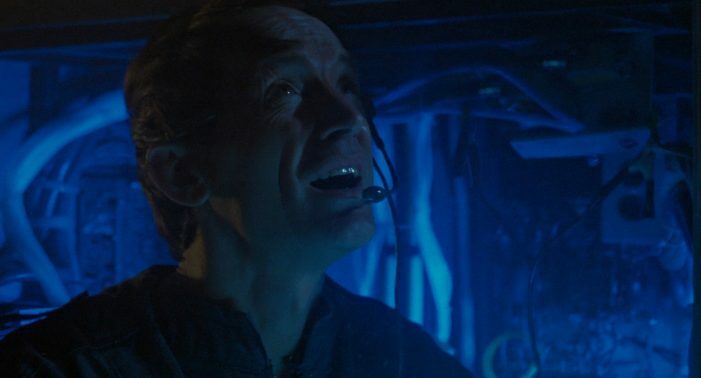 Bishop discovers that the Atmosphere Processor is going to explode in a few hours so he volunteers to go outside to the colony’s transmitter unarmed, to pilot the last remaining dropship to LV-426. Bishop leaves in a pipe for the transmitter while the others seal the pipe so nothing can get through. The xenomorphs soon overrun the compound and the team escapes. Eventually, Bishop gets to the transmitter and pilots the dropship. Ripley tells him to pick them up at a platform at the Atmosphere Processor. Only Ripley and an injured Hicks have survived the escape. Ripley tells Bishop to stay near the platform so she can rescue Newt who had been taken by the xenomorphs earlier. Ripley goes deep into the alien hive and eventually brings Newt back to the platform. At this point, the Atmosphere Processor is exploding all around them and when they reach the platform, they find the dropship gone. A few seconds later, Bishop appears in the dropship to rescue them and explains he had to move the dropship as the platform was unstable. They leave LV-426 as the Atmosphere Processor explodes and dock back on the Sulaco. As Ripley thanks Bishop for rescuing them, all of a sudden, a tail impales him through the chest and the Queen Alien descends from the dropship. She lifts Bishop up and rips him apart, severing is body in two. Newt hides under the floor grates while Ripley battles the Queen with the Power Loader suit. She activates the airlock and Bishop hangs onto Newt and the floor grates while Ripley deactivates the airlock. Ripley sets a course for Earth and they all enter hypersleep. Soon after the group enter hypersleep, the Queen Alien left an Alien Egg on the Sulaco which hatches and a Super Facehugger emerges. It attacks Ripley in her stasis tube and causes the Sulaco to eject the stasis tubes into an E.E.V. which crash lands on a prison planet called Fury 161. Hicks is killed by a support beam, Newt drowns in her stasis tube while Bishop is even further damaged. Ripley is the sole survivor of the crash. During her stay on Fury 161, she speculates that an alien was on board the E.E.V. when it crashed and goes to the scrapheap to find the remains of Bishop. She temporarily reactivates him so he can interface with the E.E.V.’s black box recorder and find out why it was ejected from the Sulaco. Ripley discovers that there was a xenomorph on board the Sulaco and was on board the E.E.V. when it crashed on Fury 161. All this information had been transmitted back to Weyland-Yutani. Bishop tells her to disconnect him as he will no longer be a state-of-the-art android and he’d rather be nothing. Bishop was a much more advanced android than Ash was and could understand humans more on a more emotional level. He was designed to copy humans as closely as possible. Bishop had superior intelligence and shown to have quicker reflexes than humans. It was also impossible for him to harm another human being either directly or indirectly due to his core programming. On LV-426, he generally served as the medic or research technician and didn’t get involved in any combat. Michael Weyland appears at the climax of 1992’s Alien 3 and is an employee of Weyland-Yutani. He is dispatched to Fury 161 to retrieve the xenomorph but arrives too late and the creature is killed. Weyland tells Ripley that he is the man that created the Bishop androids and he can safely remove the xenomorph gestating inside of her. Aaron then hits him on the head with a wrench and he is bleeding profusely. Ripley prepares to commit suicide and Weyland reveals his true motives and tells Ripley that they can study the creature for technological purposes. Ripley ignores his pleas and jumps into the furnace, killing the creature. Michael Weyland and the Weyland-Yutani commandos leave Fury 161 taking the one surviving prisoner with them. There’s been a lot of fan debate on whether or not Michael Weyland is human or an android. It is generally believed that he is human. See Bishop – Android or Human? thread for more info. 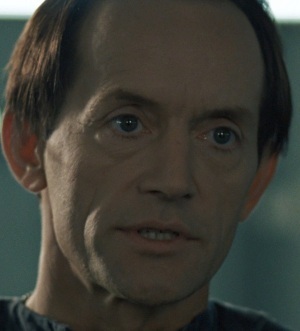 Charles Bishop Weyland, once again played by Lance Henriksen, appears in the 2004 movie Alien vs Predator and is the founder and CEO of Weyland Industries. In 2004, one of his satellites detects a heat signature in Antarctica coming from an underground pyramid under the ice. He organises an expedition to Bouvetøya island to investigate it and it’s found to be a Predator temple where Predators use it to breed and hunt xenomorphs as part of a training ritual. Weyland was already dying of lung cancer when he went on the expedition and is eventually killed when he attacks Scar Predator with a improvised flamethrower. In the 2010 video games Aliens vs Predator, Karl Bishop Weyland is an android and the director of Weyland-Yutani Corporation and leads everybody to believe he is human. Weyland is overseeing the Weyland-Yutani research facility on BG-386 and he hopes to access an ancient predator pyramid on the planet. He believes it contains predator technology that Weyland-Yutani can use. In addition, he has a team led by Dr. Groves studying the xenomorphs and when the ancient pyramid is opened, the xenomorphs escape and wreak havoc on the planet. In the final confrontation between a marine known as Rookie and Weyland, Rookie tries to retrieve a datapad but Weyland attacks him. Rookie then shoots him in the head and he falls into lava, destroying him once and for all. In the closing moments of the campaign, while Rookie, Tequila and Katya are in hypersleep, the dropship pilots transmit the information on the datapad to another Karl Bishop Weyland android who states that he now has the coordinated to the xenomorph homeworld. The same Bishop android (Hyperdyne Systems model 341-B) from Aliens appears in the 2013 video game Aliens Colonial Marines. In the year 2179, he is part of the search and rescue team aboard the USS Sephora sent to LV-426 to investigate the disappearance of the USS Sulaco. 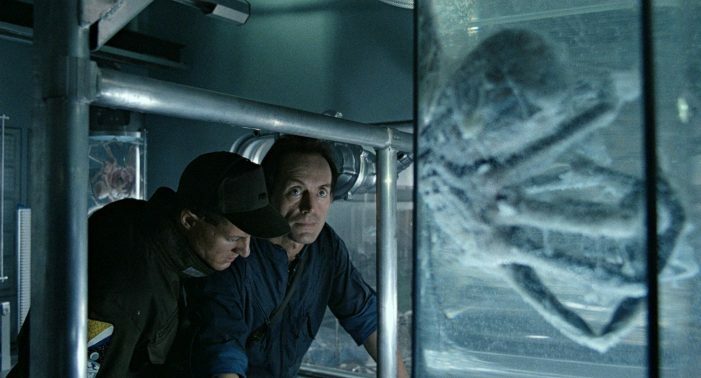 Lance Henriksen is one of the most recognizable figures in the Alien and AvP franchises, having played Bishop in Aliens, Michael Bishop in Alien 3 and Charles Weyland in AvP. He also lent his likeness and voice to the video games Aliens vs Predator as Karl Bishop Weyland, and to Aliens Colonial Marines as another Bishop android. 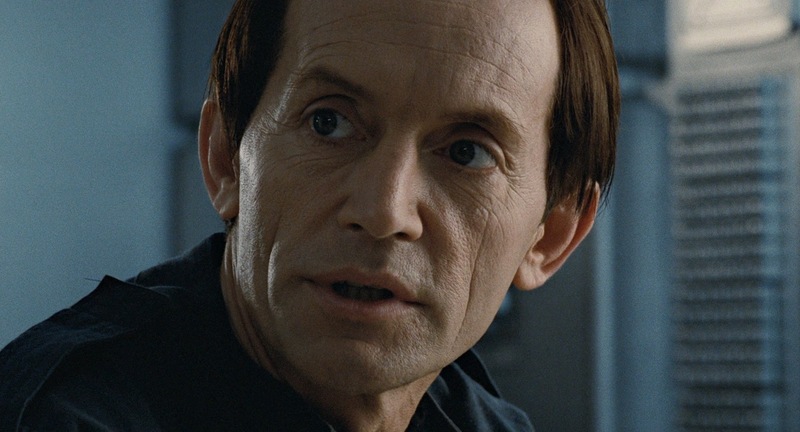 Lance Henriksen, along with Bill Paxton, are the only actors to have been ‘killed’ by an Alien, a Predator and a Terminator. In James Cameron’s original treatment for Aliens, Bishop stays on board the Sulaco for the entire mission. He refuses to rescue the remaining survivors at the end due to his programming that wouldn’t allow xenomorphs to infect the Sulaco. Bishop is the only character in the Alien series other than Ripley to appear in more than one film. There was a Kenner action figure made for Bishop but looked more robotic than human. Bishop was originally going to have a much bigger role in Alien 3. In William Gibson’s draft, Bishop and Hicks became the main characters instead of Ripley and were involved in battling the xenomorphs on a space station. The story was sort of similar to what was featured in Alien Resurrection where xenomorphs were being bred for use as weapons. What about the Wayland from Prometheus? begging to Ripley , between his ouches e.g Think of what we oouch ! can learn from it , OOUCH .. .